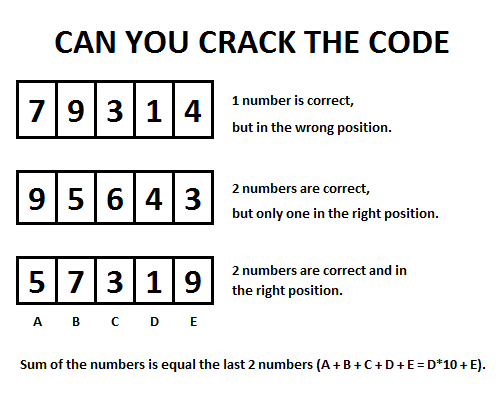 I created this "crack the code" puzzle. I hope the members here like it. 7 and 9 so 5 must be the first digit. 0 or 8 as the question mark are perfectly valid. 1, 3, 9 are not in the code, you are left with 4 and 7 as possibilities to be your digit for clue 1. 5 and 7 are your first two digits as you have eliminated the other digits from clue 3. This also eliminates 4 from clue 1 as it states that ONLY one digit from that set is correct. 3, 4 and 9 are not in the code and we have solved that 5 is the first digit which leaves 6 to be true for the only digit in the right position. Not the answer you're looking for? Browse other questions tagged mathematics logical-deduction no-computers mastermind or ask your own question.